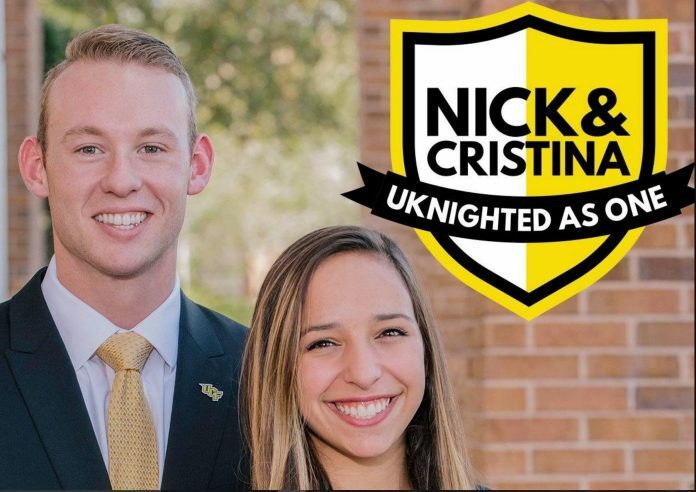 The University of Central Florida student body voted in their new Student Government Association president and vice president: Nick Larkins and Cristina Barreto. Knight News’ Kyle Swenson broke the results of the election over Facebook Live as they were announced to students. The “UKnighted As One” campaign drew 52.5% of 11,435 total votes over three days. Josh and Jad, came in at a close 47.5% second place. Larkins and Barreto platform campus life, First Time in College Students, upperclassmen, graduate students, veteran and ROTC students, parking, transportation, and safety, state and federal advocacy, the President’s cabinet and accountability, and protections for international students. Advocate for more mental health professionals at UCF and provide resources to supplement CAPS. Create a website platform for RSOs, Sports Clubs, and any other student groups to submit events/games to be posted to SGA’s online calendar. Create a “Syllabus Bank” that would require all syllabi to be submitted by each professor to allow students to review the course expectations before signing up for a class. Propose legislation to institute a block budget for fall and spring for the Conference, Registration, and Travel Committee (CRT) to prevent over drafting. Propose new scholarships to the SGA Scholarship Committee for International Students. Extend daily shuttle service 45 minutes past the last class time on campus (currently 10:30 pm) to accommodate late night students. Dramatically improve the “Knightro’s Suits” professional attire clothing rental program. Add more squat racks to the RWC Main Facility and replace the Smith machine squat rack in the RWC Knights Plaza with a free weight squat rack. Add Saunas to the Men and Women’s locker rooms in the RWC Main Facility. Partner with Green Greeks in their effort to educate students about the importance of locally harvested produce and their fight to end food insecurity. Partner with UCF Athletics to improve attendance and interest in all UCF Sporting Events by proposing student discounts at concessions. Install Eco-Friendly light switches in the classroom buildings. Creation of one unified SGA mentorship council to help foster the development of future SGA leaders while allowing them to experience the day-to-day work of all three branches. Partner with The Hub and the Office of Student Involvement to create an advisory council which actively seeks to notify Freshmen, Transfer, and First Time In College (FTIC) students of ways to get involved on campus. Create a scholarship program to allow Knights in need to get their cap and gown at low or no cost to the graduate. Partner with Career Services to create a scholarship allowing UCF Alumni to use the Resume Review and Mock Interview Services offered by Career Services for up to one year following graduation from UCF. Create a “Graduate Student Outreach Coordinator” position to effectively advocate for the needs of over 8,000 graduate students. Actively seek to fill the 8 Graduate Student SGA Senate Seats to ensure ample representation of nearly 8,000 students. Ensure that Graduate Students taking classes off of the main campus are plugged into events and services being offered to all students, including those in a graduate program. Create a “Student Veterans Affairs Coordinator” position to advocate for the needs of student veterans and those who will soon be joining the military (UCF ROTC) as well as forging a better relationship with the Veterans Academic Resource Center (VARC). Host events specifically to enrich the lives of our Military Personnel at Veteran/ROTC students during the National Military Appreciation Month (May). Host events to show our appreciation of Veteran/ROTC students during Veterans Day, Memorial Day, and Armed Forces Day. Partner with Veterans Academic Affairs Center (VARC) to market this department and all of its services to all eligible students. Work with University administrators to explore new and innovative ways to solve the parking crisis. Change current policy to restrict the number of decals sold. Make shuttle system more reliable and convenient to encourage use. Ensure that the Park and Ride lot is comfortable for use and that the service is quick and reliable. Open a SEPS dispatch center in the Student Union to dramatically shorten response times. Expand the handicap accessible (ADA Compliant) SEPS fleet. Lobby for better lighting in the off-campus Greek neighborhood. Provide game day shuttles to and from the off-campus greek housing neighborhood to reduce alcohol-involved incidents. Advocate for security cameras around campus and in parking garages. Advocate for more mental health funding and for the hiring of more mental health professionals. Restoring the Bright Futures Funding levels to the maximum amount. Work closely with UCF Student/ State Representative Amber Mariano to push student friendly legislation through the Florida Legislature. Create a “College & Satellite Campus Outreach Coordinator” position to better integrate satellite campuses with UCF main campus life. Cut wasteful spending from within the Executive Branch and spend that money on more useful services for students. Monthly video addresses to update the university on the progress of SGA/ Nick and Cristina Administration platform point progress. Require all A&SF Funded departments/agencies to submit an end of year line item expenditure report to the SGA Senate and A&SF Business Office. Require all cabinet members to sign a FERPA waiver to provide better transparency. UCF Police Department does not gather information about the citizenship or immigration status of who they interact with. UCF is committed to protecting student confidentiality and not sharing private information about students unless compelled to do so by a court order. UCF and Student Government will work with their community partners to further mobilize support for these initiatives.